10 Pack high density 2 inch foam brushes, with wood handle. Has a chisel tip foam head with internal plastic stiffener. Use for touch ups, edged and smaller areas. Ideal with paints, stains and varnishes. 2 pack of 6" mini extra high density foam rollers for smoother bubble free finish. Rollers conform to irregular surfaces. Excellent for trim and small jobs, doors and tight areas. BENNETT 3 Pack, 250 ft x 13/16 inch Pre-Glued Melamine, white Iron on Edging. 3 Pack edge tape rolls each measuring 250 FT in Length by 13/16" (21mm) wide. A soft forming White melamine edge veneer tape with a thickness of 5mil. This Bennett edging is smooth coloured printed tape, with a flat finish. The paper is laminated with a melamine coating with a light stipple texture for durability. This gives the appearance of a gloss finish. This edge tape has strong flexibility, application for this edge tape will be easy around tight edges and curves. Enough flexibility to wrap around surfaces as small as the diameter of a quarter. Bennett melamine edge tape is also pre- glued for that clean and easy application. The process is simply, an iron on job with your very own home standard iron on Cotton Setting. This results in no special hardware tools, and no messy cleanups. This product is excellent for a fast and quick repair for existing cabinets and furniture. A great DIY product and an ideal purchase for a contractor. The industry - first innovative TrueCoat FlexLiner Bag System makes fast work of indoor and outdoor painting or staining projects. It's simple to use - just fill with paint, squeeze out the air and spray. This large 42 oz. paint bag system requires less refills and allows for spraying in any direction, even upside down. 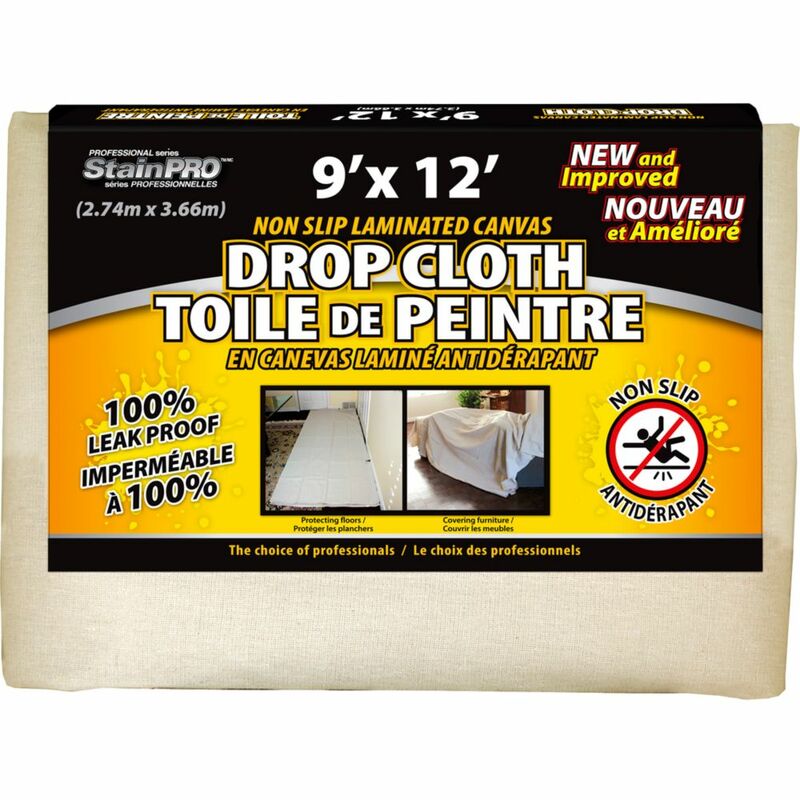 Non Slip Laminated Canvas Drop Cloth 9 Feet x 12 Feet - 2 pack Get the best of both worlds. These unique drop cloths combine a top layer of canvas that captures, absorbs and promotes drying of paint spills or splatters as it is trapped within the weave structure. A second unique bottom layer of NON SLIP polypropylene laminate provides 100% leak proof protection and stays put. Avoid a mess before it happens by using these professional quality grade drop cloths.